Watching this movie today is a bit of a revelation. I remember it being a lot better than it actually is. There is a laziness about the film that probably made it charming at one time, but now it seems a bit belabored. There is a nice sense of time and place in the film, and it is entertaining enough if you are not very discriminating. Burt Reynolds was a huge star in the 1970's, he and Clint Eastwood changed back and forth the position of number one box office star several times in the decade. Clint's movies are designed to tell a story in a careful manner and they all hold up over time. Burt on the other hand, gets by with some smirking and car chases, he has a big success with it and then the movie ages poorly. 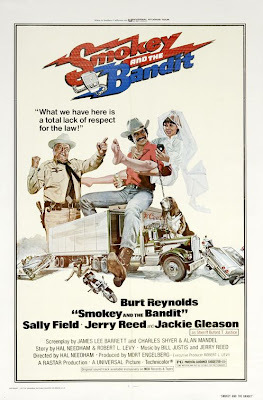 This is the second of the Burt Reynold's films on my list for the blog. I have at least two more, this one was the most financially successful of the movies on the list. This movie was the number two box office hit of 1977, losing the number one spot to that little space movie that opened pretty much the same week. It is hard to believe that the movie was so popular but I think it caught several things at exactly the right time. Burt Reynolds was a good actor who was becoming a big movie star and his personality was being included more and more in his movies. Sally Field was on the cusp of becoming a serious actress after having been a TV personality for several years. Two years after this she won the Academy Award for Best Actress in Norma Rae. The CB phenomena was at it's height when the movie came out. The year before, when we traveled across the country in my parents Chrysler Town and Country Station Wagon, my brother brought along his CB radio that he had been using for several months. In those days, there were no mobile phones and the idea of talking to someone else in another vehicle seemed powerful and adventuresome. There had been songs and stories about truckers and this movie capitalized on that trend. It would be another year before a big trucker based movie, Convoy, would come out so this movie had the market all to itself. Coors beer was not available in all of the states and it had been written about as a special luxury, sort of like Cuban cigars. I remember reading a story about Secretary of State Henry Kissinger, requesting a case of Coors for some function, in part because it was hard to come by in D.C. and it would make a big splash. Since it was in the news and it is the contraband that the two truckers are trying to move, it probably added to the publicity. This movie is a success primarily because of good timing. I'm pretty sure that Dee and I saw this at the General Cinema at the Santa Anita Mall. We saw movies there all the time when we were dating and up though the time the kids were about six or seven. It was convenient to go to a movie at the mall because you could shop afterward and get something to eat. The experience was obviously not something that sticks in my mind, today is probably the third time I have seen the movie all the way through including the first time in 1977. It still seems ephemeral to me, since there is largely no plot and the characters are just stereotypes. The two things that I do remember from the film each time I see it are the bridge stunt with the Trans Am flying through the air and Jerry Reed, running over all the motorcycles after having fought the bikers in the diner. It was a scene based on a joke I had heard many years before and I thought it fit right in with the rest of the nonsense in this movie. My buddy Jon Cassanelli acquired a black Trans Am, the summer this movie came out. I don't know why it never occurred to me before, but this movie was probably a big reason for him getting that car. I'll bet that Trans Am sales were up all over the place after this movie came out. That may be Smokey and the Bandits biggest legacy, providing one last kick for the muscle car market before gas prices started scaring everyone away from those types of guzzlers. So have a Coors, drive in your Trans Am, and wish your girlfriend was as cute as a button like Sally Field, but you should recognize that even Burt Reynolds doesn't have enough charm to keep this lifestyle fresh.